Since Jesus never said the exact words, "I am God. Worship Me," Muslims say Jesus cannot be God. Apparently the problem is one of a lack of logic in the thinking of the Muslim who first posited this argument. He was the Muslim showman named Ahmed Deedat, now deceased. Muslim Deedat Fans, please note as well that this sample truck DOES have the words "Fire Dept" on its sides. 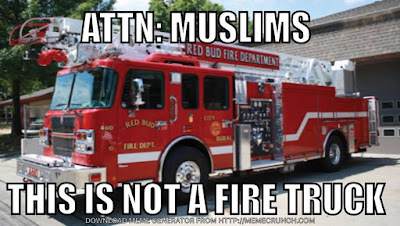 But according to Deedat's poorly conceived argument, this necessarily means that the truck is a Fire Department, which in actuality is the office which dispatches fire trucks. Sadly, fire departments are housed in buildings without wheels or fire equipment, which means that this fire truck will not meet your criteria for what a fire truck is. Thus, it will remain unavailable to you to save the lives of you and your family should you ever require its services, God forbid. That is, for as long as you insist on following Deedat's bad logic. The moral of the story is: do not unthinkingly accept everything your showmen, imams or apologists tell you. Instead, think each claim through for soundness, rationality and good old common sense. Soon enough, you will find yourselves reading the Bible and giving your lives to Jesus Christ as your Lord and Savior.